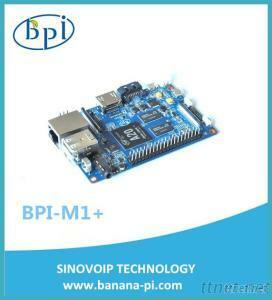 Banana PI BPI-M1+ is an Open Source hardware platform. Banana PI a dual core, Android 4.4, linux system support product which is much betterthan the Raspberry Pi. BPI-M1+ have SDIO WiFi module on board and have 40 PIN as rasbperry pi. The Banana Pi BPI-M1+ hardware runs Android, Debian Linux, Ubuntu Linux, OpenSuse linux and images that run on the Raspberry Pi and Cubieboard. It can easily run games as it supports 1080P high definition video output. The GPIO is compatible with Raspberry Pi 2 and can run Raspberry Pi images directly. 40 Pins Header, 28×GPIO, some of which can be used for specific functions including UART, I2C, SPI, PWM, CAN, I2S, SPDIF, LRADC, ADC, LINE-IN, FM-IN, HP-IN. Computers & Information Technology, Commercial Electronic Accessories, Commercial Electronic Accessories/n.e.s.